It is essential that you burn well seasoned wood in order to get the best results from your stove/cooker, ideally wood should have a moisture content of 20% or less. Freshly harvested wood will naturally contain a high volume of water and will therefore need to be seasoned before it can be used in our appliances. Ideally freshly felled logs should be left out to weather for a season or two to enable natural osmosis to take place. The logs get wet, then dry out over a period of time, this helps to reduce resin & sap. The logs should then be dried in a correctly constructed log store to promote drying. Air needs to circulate all around in order to achieve this. Large logs should be split to speed the process up. Hardwoods and softwoods both have similar heat outputs, however softwoods will burn nearly twice as fast as hardwoods as they are far less dense in structure. Wood burning is often described as being carbon neutral this is because when the wood burns it can only produce as much carbon dioxide as it absorbed whilst it was alive. The main idea of carbon neutral is that the wood log would have emitted exactly the same amount of carbon dioxide should it have been left to decompose naturally. Wood is a sustainable fuel unlike other alternative fuels such as Coal and Oil. We can supply bespoke made to measure log stores or off the peg stores and give advice about storage. We have a sample in the showroom. Q. What sort of Stove do I need? A. That depends on many things, the size of the room, the insulation properties of the home, the type of flue, the type of fuel you wish to burn, style cost etc. Many people make the mistake of buying a big stove because it looks good, problem is its in an average sized room and they can’t use it because it gets too hot. There is no substitute for good advice from a trained engineer (not just a salesperson). Q. Will I need a liner? A. In virtually all cases the answer is yes, unless the property has had an insulated liner fitted as part of the construction. Putting a stove pipe into an unlined brick flue or uninsulated clay liner can be asking for trouble. We use high quality 904 grade flexible Stainless Steel liner or a CICO cast in situ liner. Q. Why do I need a liner if I have a clay liner installed? A. Since 1965 all properties should have a liner installed and not just rely on a brick flue, generally a clay or similar liner will work well on an open fire but when you introduce a stove into the equation unless the liner has been backfilled between the void and the outside of the liner problems with condensation can occur. All flexible liners we install are backfilled with insulation; this reduces condensation issues and improves the efficiency of the appliance. We will install on a clay liner providing we can be sure that cleaning of the flue can be carried out effectively and that the customer is prepared to accept that if condensation forms a liner will need to be retro fitted. 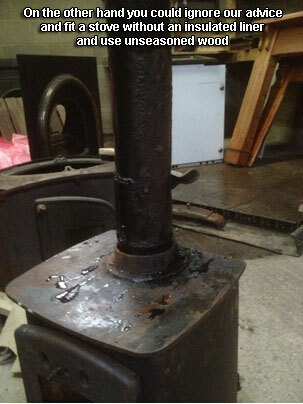 Q. I would love a wood burner but I don’t have a chimney. A. No problem, we can install a twin wall stainless steel chimney or a pumice block system chimney. Q. Can I run central heating from my stove? A. Yes of course, but the system must be correctly designed, heat calculations carried out, and remember that if you are not having a link up system the mechanics of keeping a heating system running with solid fuel only is very labour intensive. Q. 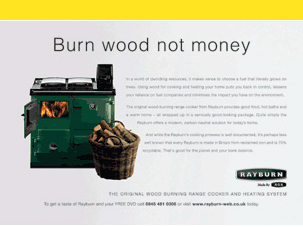 Should I have a Wood burner or a Multifuel appliance? A. Wood and Fossil fuels have different burning characteristics and therefore there are subtle differences in the stoves that are designed to burn either or both. If you have access to good quality, seasoned and managed wood and have a thought for the environment then a carbon neutral wood burner is for you. Bear in mind that if you are running a heating system from the stove or cooker, it may be difficult to keep it in at night on wood alone. Fossil fuels have more calorific value so they will produce more heat, the choice is yours (we run a wood burner and a multifuel Rayburn).